I always use checkgmail... I like its simplicity and its sobriety . It 's a simple python script with some setting files. But there has been no change in its code for a long time and now it is discontinued. It continue to work if we put the right arguments on command line. We can only change status icons and background color icon to improve his appearance from preferences window. But to adapt checkgmail's colors to your desktop theme, we need to see what's happened in the script and it is not very easy. That's why i have improve some things in the code in order to facilitate the popup windows colors setting directly by editing the start of the scripts without you need to get your hands so dirty. The default colors setting is adapt to original Ubuntu theme, but you can change it easily (see below). Finally, launch it fromthe menu. You can now open the preferences window (right-click on tray-icon) and complete it. It 's possible to improve the code integrating colors settings in the preferences window, time to get your groove on!. All colors variables are at the script start now. Finally just a word to say that we now launch checkgmail without '-no_cookies' argument. it was just enough to put $cookies variable to 0 line ~67, hopping that we need it a future day and... add original links to delete, mark as read,etc... in the popup window! It should be able to to code this with 'imap' and 'email' libraries. 2014-10-11: monojp has hacked checkgmail. 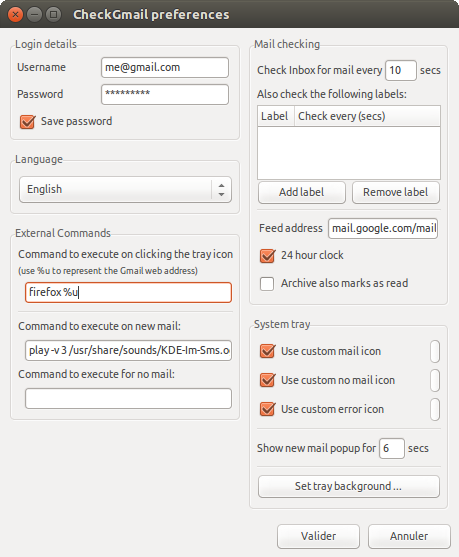 It allows to manage again mails from the popup window. I have re-wright my color themable version base on this hack ! I'm so glad for this article. It was very useful for me. Thanks!! !